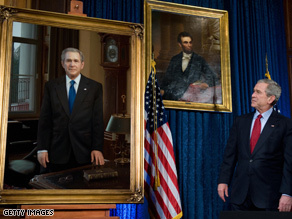 Bush got a look at a new presidential portrait Saturday. (CNN) - President Bush has often said he doesn’t dwell on how others view him – but he spent plenty of time Saturday taking in one conception, attending the unveiling of a presidential portrait in at a private club in Philadelphia. "Welcome to my hanging," said Bush, to laughter from the crowd. Artist Mark Carder painted the portrait after taking hundreds of photos of Bush this spring. In it, Bush is standing in the White House Treaty Room, looking straight ahead. John Starnes Tampa Florida You are ignorant. Those Americans gave there life for your freedom. You have no idea there sacrifice or there families. So dont even dare bring them into your arguement. I got an idea go to Detroit. See how many people die there this month. From murders alone. At the end of the month tell me where there are more. Then sit there are think about who died for more the drug dealers or the troops. There should be Congressional investigations into everything the Bush Administration got involved with and trails forthwith!!! George isn't keeping us safe. Bin Laden doesn't need to bother attacking us, he has already won. He has realized his goal. We've been terrorized into two wars. And our economy is in a shambles. He broke us just like the Soviets, just like he said he would. Also, In the name of the Almighty Stock value we have outsourced white collar jobs to overseas companies and taken away the careers of many middle aged professionals. The Bush suggestion of getting re-trained is at best naive. The bills don't go away. Who can afford to start over at age 55? So we go bankrupt and lose our homes. I hope the next administration does a good job. But I believe it's too late to prevent next year from being an economic nightmare. We ain't seen nothin yet. Squirrel stew anyone? Just to clarify, I am a strong Obama supporter. I hope when people look back on President Bush's term in office, they will take an honest and fair view of what is truly an accomplishment and what has been a failure. He did inherit an economy that was at the peak of it's bubble and ready to burst, and is handing off one that has been popped from another bubble. As much as people may want to blame him as a convenient scapegoat, he can not be blamed any more for the ups and downs of the economy any more than President Clinton can be given credit for the good economy that existed during the tech bubble. As far as Iraq, I think that there were more diplomatic alternatives to consider before pushing for war, but then again, he was given the right by the Congress, most of whom didn't even read the report. Our government is built on the concepts of checks and balances, so no one man has all the power and no one man should have to take all the blame when this country is headed in the wrong path. I, for one, will remember him as a good man who stuck to his convictions, did his best, made mistakes, and has the sense of integrity to take the blame as a good leader should when his team has failures. I won't downgrade the failings of his administration, but I won't make him the scapegoat for everything that has happened in the past 8 years because it is easy and popular.